This report finds that art and artists can make a positive contribution to healthcare settings, enhance healing environments and contribute to cultural change. Projects like Art-Lift help to reduce anxiety and depression in some patients. Arts can provide a resource for health professionals challenged to offer responses to problems that are not directly medical. Training and supervision of artists in healthcare needs to ensure they are flexible to organizational systems, inter-professional working and health needs. Further research is needed on clinical outcomes and the impact of projects like Art-Lift. A key aim of the project was to provide evidence to make a case for long term funding for Arts and Health work in Gloucestershire, the South West and beyond. The project created 15 artists residencies in three different types of healthcare settings; primary (GP surgeries), acute (Hospital settings) and mental health, with artists drawn from a range of forms including pottery; painting; poetry and literature; and other arts. Daykin, N., McClean, S., & Pilkington, P. (2008). 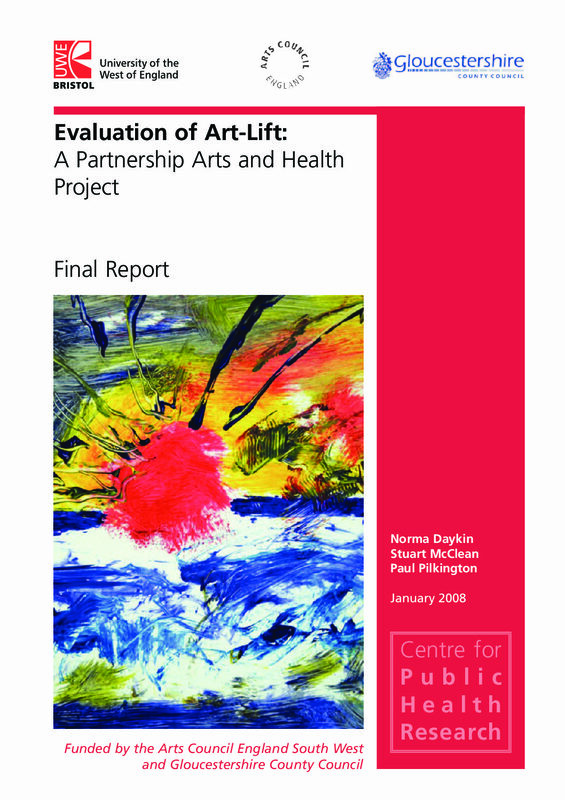 Evaluation of Art-Lift: A partnership arts and health project. Bristol: University of the West of England.